All participants will meet at 4:30 a.m. in the parking lot of Cobblestone Inn, Newton, on the morning of the field trip. 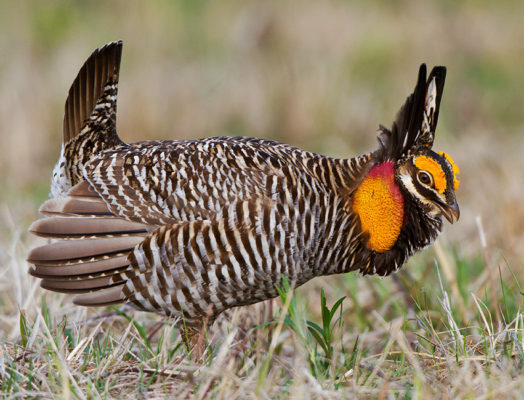 This will allow time for the group to be seated in the blind before the prairie chickens arrive on the booming grounds. A field trip guide will lead the caravan to a designated parking spot near the blind, lead the group to the blind and will remain with the group throughout the experience. Everyone must be able to hike .25 mile on muddy, uneven terrain from their car to the blinds with minimal light. Participants should expect to be in the viewing blind approximately five hours. Once the group is seated in the blind, participants are not allowed to leave; there are no restrooms or heat in the blinds. The structures are approximately 15 ft long x 8 ft wide x 8 ft high. Date: April 7, 2019 Time: 4:30 a.m. - 10:30 a.m.